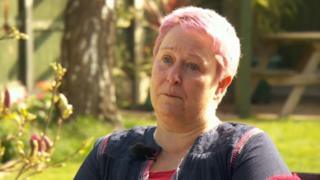 A long-serving midwife who said she was stopped from working because of her dyed red hair has resigned. Donna Crichton, from Sleaford, Lincolnshire was told by United Lincolnshire Hospitals Trust (ULHT) her hair colour was not acceptable under the trust's new uniform policy. She said her relationship with the NHS trust was "broken beyond repair". The trust said it expected "all members of staff to comply with agreed policies". Ms Crichton, who worked as a midwife for more that 30 years, said she first dyed her hair red in 2004 and it was not raised with her when she was taken on by the trust more than seven years ago. She said she was only notified of the uniform breach and sent home at the end of June last year, after the trust updated its uniform policy in October 2017. "I feel the relationship with ULHT is broken beyond repair." She added: "My whole life has been turned upside down just because of a decision I made years and years and years ago about how I would look." Martin Rayson, from ULHT, said: "We do expect all members of staff to comply with agreed policies and procedures. "However, we would encourage any member of staff with a query around the application of our dress code and uniform policy to speak with their manager or the HR team to address any concerns they might have."